Rob and I have shared the same general idea about the commercialism of Halloween, but now our eldest, Lily is getting quite excited about these small seasonal "holidays" and with all the associated preschool activities, we decided that this year she will have her first Halloween bucket. The Halloween bucket itself was from Sainsburys, and only cost 50 pence and features a bewildered looking carved pumpkin on the front. Should we take her out Trick or Treating, the bucket has a handle so she can carry her loot. 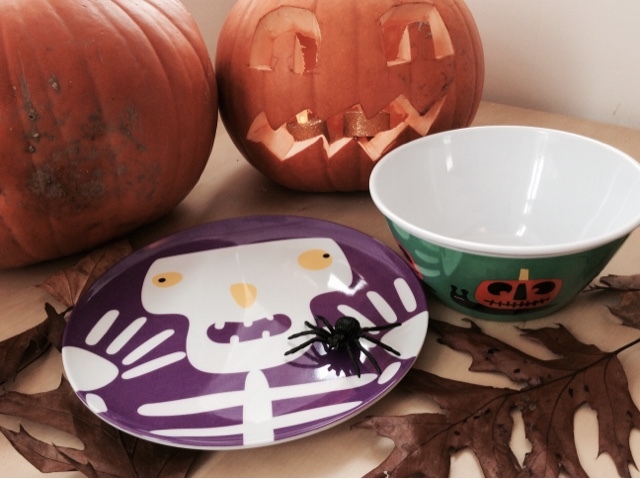 I couldn't fit the tableware in the bucket, but we also have a purple skeleton plate which features yellow eyes and the matching bowl, as well as the pumpkin -snail design bowl. Rob chose that one for himself! It's a shame that these plates and bowls aren't dishwasher safe, but they will live happily on our plate cupboard, coming out throughout the year when we have run out of plates! This is more of a Halloween bucket for all of us in a way; inside the bucket is a toffee apple, which may be snaffled by the resident apple addict. Toffee apples are a bit disappointing sometimes as the apple becomes all soft due to the sugary coating and sometimes mum's drop them before paying for them. Whoops! 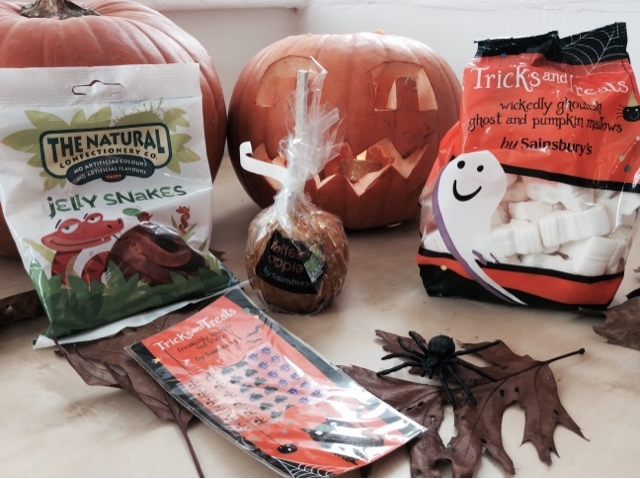 There is also a bag of spooky-shaped marshmallows which may top a hot chocolate for me, or a hot strawberry Nesquick milk for Lily. 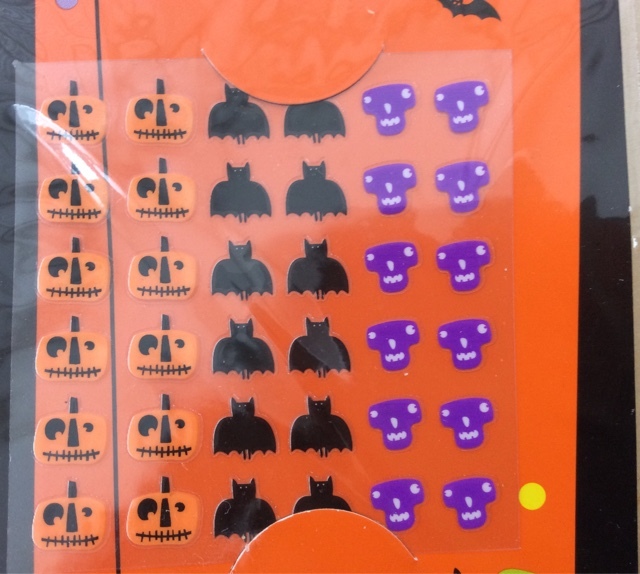 I added a bag of Rob's favourite gummy worms by The Natural Confectionary Company, and as a bit of fun for me and Lily I bought a sheet of Halloween nail art stickers, which just peel off the plastic and can be smoothed over the nail. They also are in the main designs which Sainsbury's brought out this year. Friendly, not scary. Lily will be dressing as a black and white cat, complete with a pink, jewel-adorned bow tie, cat ears and tail and a pink net frilly skirt which dumps glitter absolutely everywhere. "She's not wearing the skirt in the car!" said Rob. 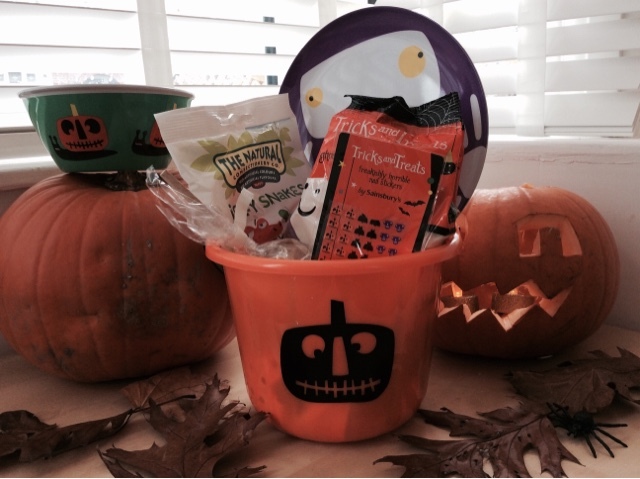 How about you, did you have Halloween buckets or did you grow up with dressing up and Trick or Treating? I love the nail stickers. So easy to use and add that extra Halloween spooky-ness!